^I'm pretty sure she does. I've seen images from later in the story where she's riding a motorcycle. But there are also images of Crimson A1 fighting Giant Armaros so she might be able to fuse/unfuse with it at will or something. hui43210 wrote: Man, with the amount of light novels getting Western releases, I really this hope comes out one day. Come on Dark Horse or Yen Press or somebody! Maybe Dark Horse will tackle it once they're done with the Raising Project manga. Because it would be nice to definitely know for sure what happened. Does it end with a "ship" or something? Like Shinji Asuka or Toji Hikari. DarkBluePhoenix wrote: Maybe Dark Horse will tackle it once they're done with the Raising Project manga. Because it would be nice to definitely know for sure what happened. Here we go. I found the images on my external. They're from the "missing chapters" but I don't know what order they're supposed to be in. One of the Ayanamis is present there too but I'm not sure which one it is. Oh, I forgot. Asuka does get separated from Unit 02 at the end of 'Season' 2. She seems to materialize in the entry plug of Rei Cinq's Unit 0.0 while everyone is in space fighting Armaros in his first form and is safely rescued. Sadly Rei Cinq and her Eva are apparently swallowed up by the Sphere of Longinus and killed not long after. 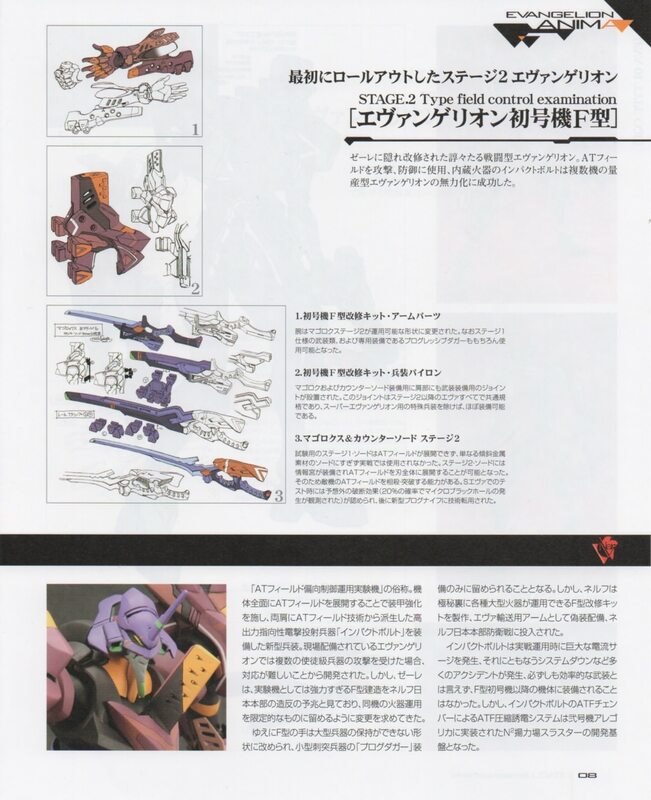 Well, in the first image you have Super Evangelion Final Stage facing off against Armaros (form 2) and one of its Torwarts (the black eyeless Eva on the far left. 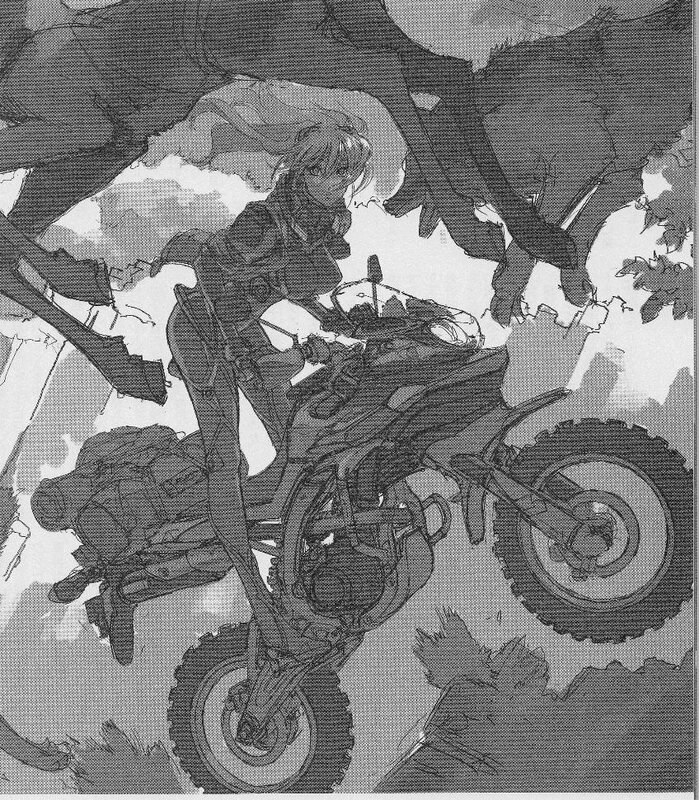 Below that is Mari's US Eva Beast/WOLFPAC in its beast mode carrying Unit 02 away, and in the foreground and bottom image you have Asuka riding a dirtbike among a herd of animals. I think that first image is a composite or a collage because the scale is all wonky. 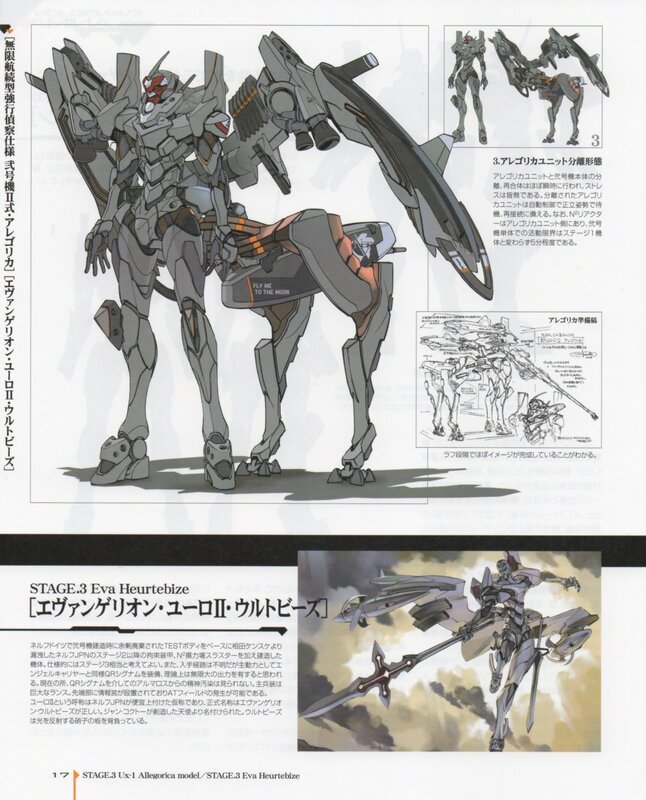 As you can see based on Unit 02, Wolfpac is a colossal quadruped Eva. 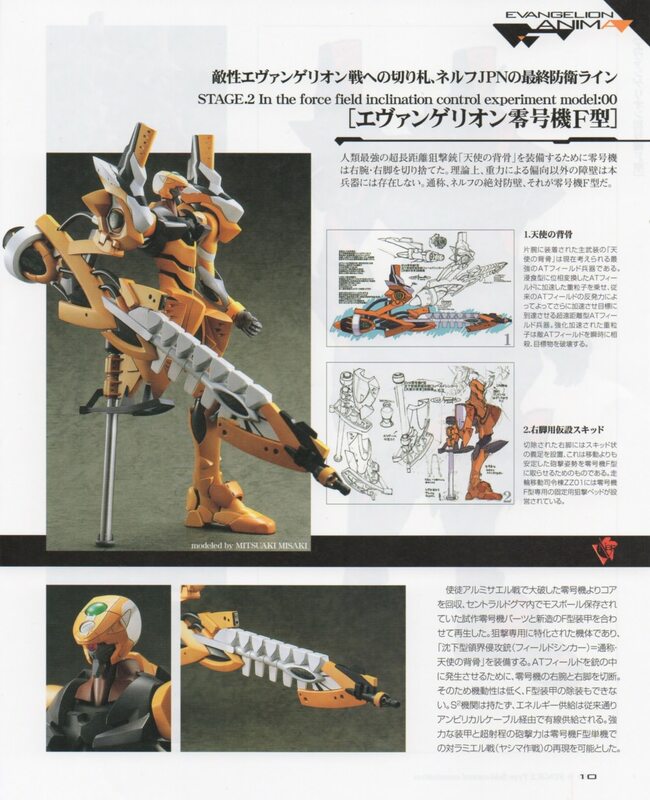 It stands at least twice as tall as a normal one at the shoulders, so it should be bigger than the rest of the Evas on that page. Armaros can become a giant but as far as I know the Torwart can't. Plus the perspective on that battleship makes no sense otherwise. The last picture is the final battle from what I understand. Armaros has become a giant to attack the Earth through some unknown means. Asuka re-fuses with Unit 02 to become Crimson A1. One of the Ayanamis is also attacking in an Eva0.0. I'm thinking it might be Rei Six (the child one). Each of the new Ayanamis pilots a Unit 0.0, but Rei Cinq's is destroyed, Rei Quatre's has a crest on the head and is apparently hijacked by an evil brainwashed Kaji after she gets over her crazy yandere phase and defects back to NERV JPN. Rei 3 pilots an upgraded form of the original Eva 00 but it has a peg leg and is specialized for sniping. Also I don't think it can fly. Then Unit 01 has become the Giant of Light to combat Armaros. What I've been able to glean is that Anima Shinji was originally part of Adam. Adam wanted to become worthy of meeting its creator so it expelled the 'sinful' human part of itself. Kaworu not so subtly indicates that this is Shinji but he also says that that information isn't something for the Shinji of this world to know but the Shinji of the 'next world' will. I guess Kaworu can dimension hop or something, as he says no matter which Shinji he meets, they'll always be allies. The Kaworu in Super Robot Wars also has this sort of meta-awareness where he knows about other Eva continuities and universes. I know it's lead some people to speculate that this Kaworu and the Rebuild Kaworu are the same individual. Anyway, at the beginning of the story Unit 01 takes Shinji's heart into itself after they're grievously wounded and rebuilds itself as Super Eva. That's the triangular thing on its chest. Supposedly this makes them one being split into two bodies, and I guess that includes the Adam influence as Super Evangelion awakens into the Giant of Light at the end of Season 2 while fighting Armaros and is encased in a shell that looks exactly like Adam circa Second Impact, wings and all. 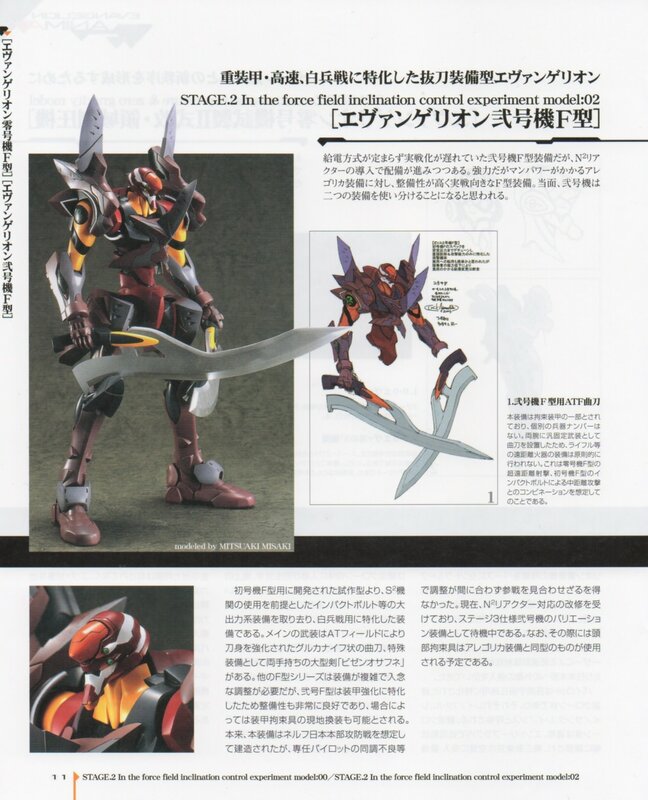 After it smacks Armaros down the first time, something happens to it and it evolves into Super Evangelion Final Stage. I guess Armaros is some kind of "Black Adam" that's either piloted or is this "Dark Kaworu" who hates Lilin and music. It's the main villain of the story but I don't know a whole lot more about it or where it came from. It suddenly shows up on the moon early in Part 1 and takes control of the Spear of Longinus, and iirc it causes catastrophic damage to the Earth by encasing it in some kind of gravity well. It can also power other Evas with these red and black tablets called "QR Signum" that spawn from its body. 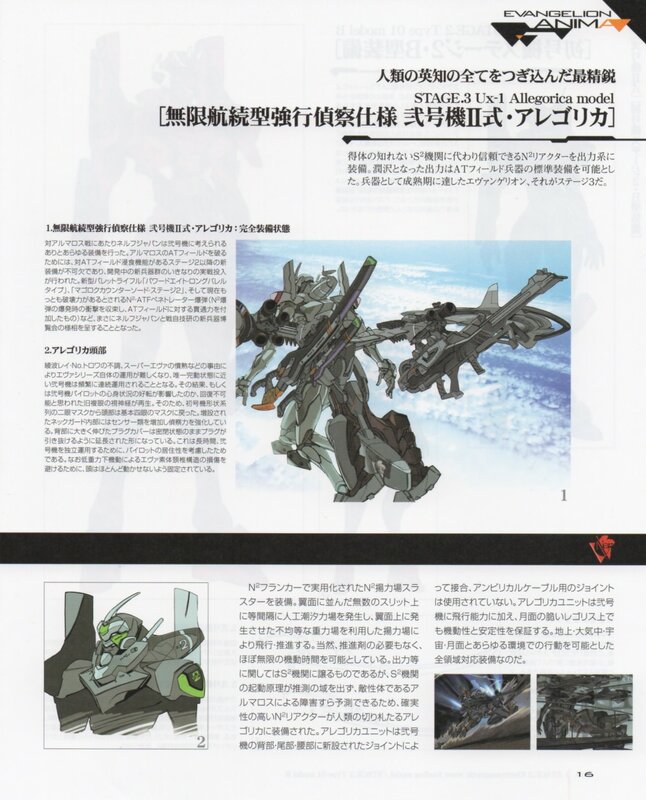 Originally it looked a lot like a black version of Mark.06 in knight armor with blocky wings, but it seems to have assimilated Hikari's Eva Euro-II Heurtebize (a test-bed unit for the original Unit 2) to transform into that bulky second form. Part of Kaworu's soul merges with Shinji and they take it out at the end of the story before Kaworu leaves. Third Impact never happened in this story since Shinji defeated the Eva series, so how the hell Kaworu is there at all is anyone's guess. I supposed the "Dark" Kaworu could have come from another world or another timeline. That's what I've pieced together based on the fragmentary information available anyway. I'm sure it doesn't seem quite as insane with the proper context. Those are from the Anima Visual Book that was released in...2010? It's pretty easy to find the whole thing in digital or print format with a bit of searching! You know what I really want right now? An animated adaptation of ANIMA, whether a TV series or OVAs. And I mean a faithful one, i.e. it retains all of the character designs and plot rather than "sanitize" them for "mainstream" viewers. ^ Well if that ever happened, at least we'd finally be able to understand the plot of this rather than relying solely on bits and pieces of plot that make no sense out of context. BlueBasilisk wrote: Those are from the Anima Visual Book that was released in...2010? It's pretty easy to find the whole thing in digital or print format with a bit of searching! It's a very piecemeal Eva and it really shows in the design. 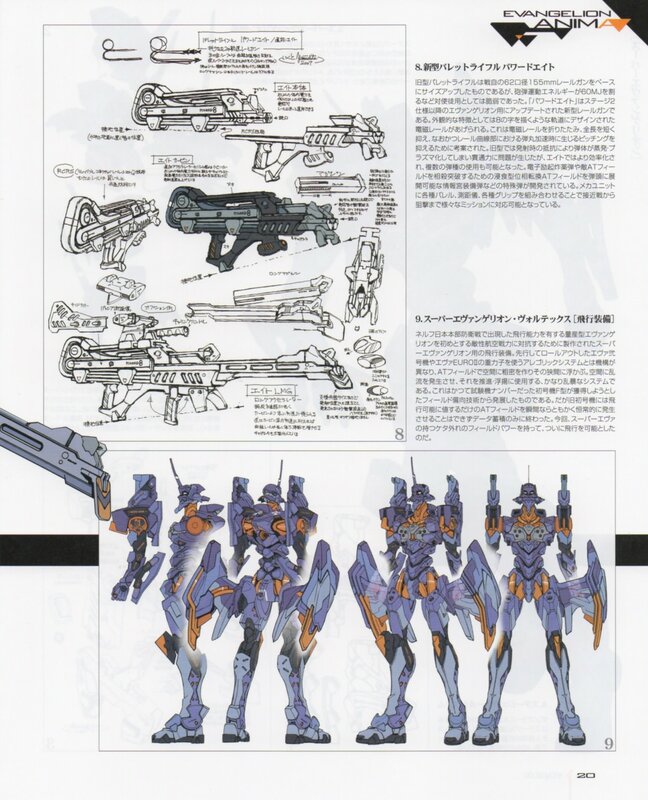 This Unit 00 barely shows up in the chapter art. Out of all the chapters that were scanned I think it shows up on page in maybe 4. I'm not even sure what it contributes to the story. Yamashita should have just given Rei 3 a 0.0 like the others. BlueBasilisk wrote: It's a very piecemeal Eva and it really shows in the design. 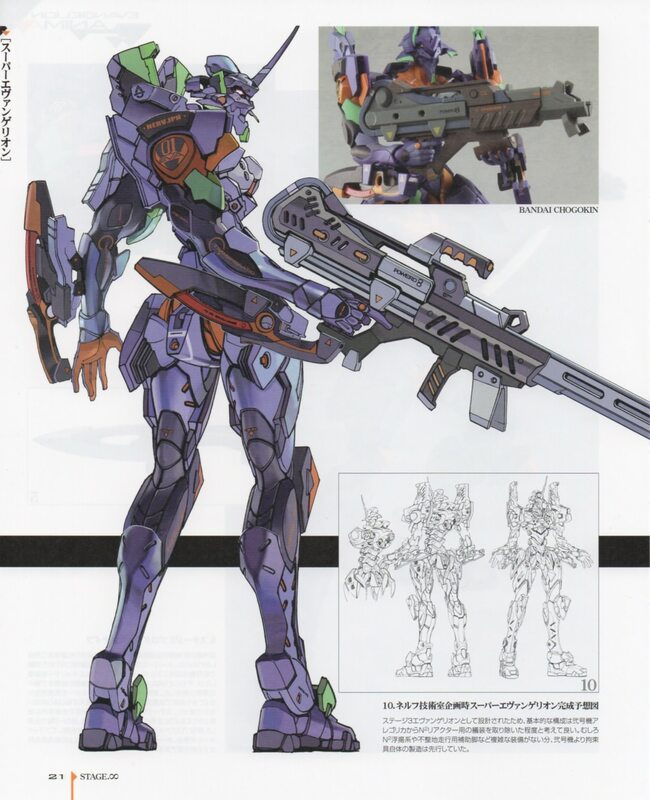 This Unit 00 barely shows up in the chapter art. Out of all the chapters that were scanned I think it shows up on page in maybe 4. I'm not even sure what it contributes to the story. Yamashita should have just given Rei 3 a 0.0 like the others. I mean, I like the idea of the mechanical arm and leg, but... why did they have to pick something that looks like a wartime field fix using whatever ressources were at hand? Blockio wrote: I mean, I like the idea of the mechanical arm and leg, but... why did they have to pick something that looks like a wartime field fix using whatever ressources were at hand? I'm a little fuzzy on the details but I believe that's what it is. Nerv pieced it together from the core of Unit 00 (which somehow survived exploding, I guess), the MP Evas, the F-type armor and whatever else they had lying around. ^ So Unit-00 is basically EVA-Frankenstein. BlueBasilisk wrote: I'm a little fuzzy on the details but I believe that's what it is. Nerv pieced it together from the core of Unit 00 (which somehow survived exploding, I guess), the MP Evas, the F-type armor and whatever else they had lying around. That doesnt explain my main concern... this abomination of a steampunk leg. 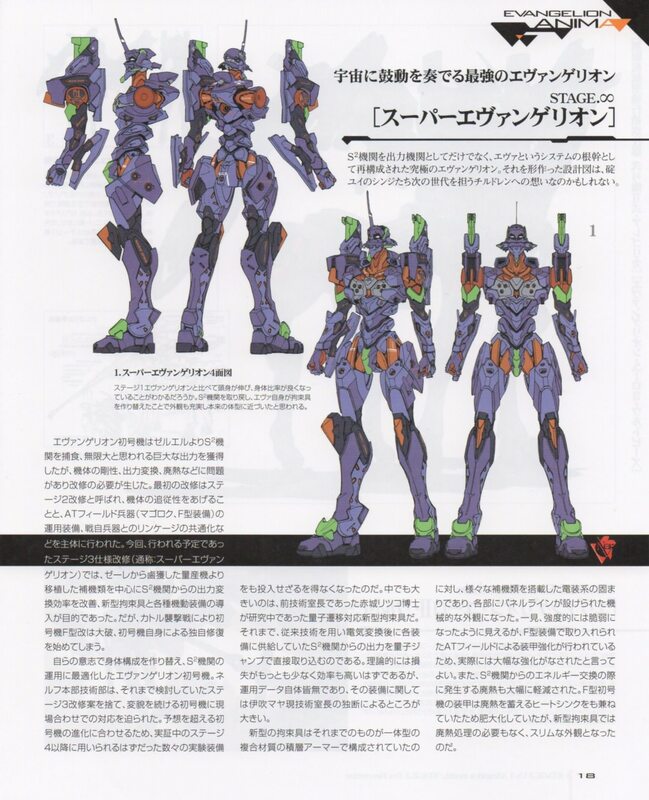 They had the funds to completely redo the armor of Unit 01 every time its power somehow increased, but they couldnt afford to give Unit 00 a practical leg? Blockio wrote: That doesnt explain my main concern... this abomination of a steampunk leg. 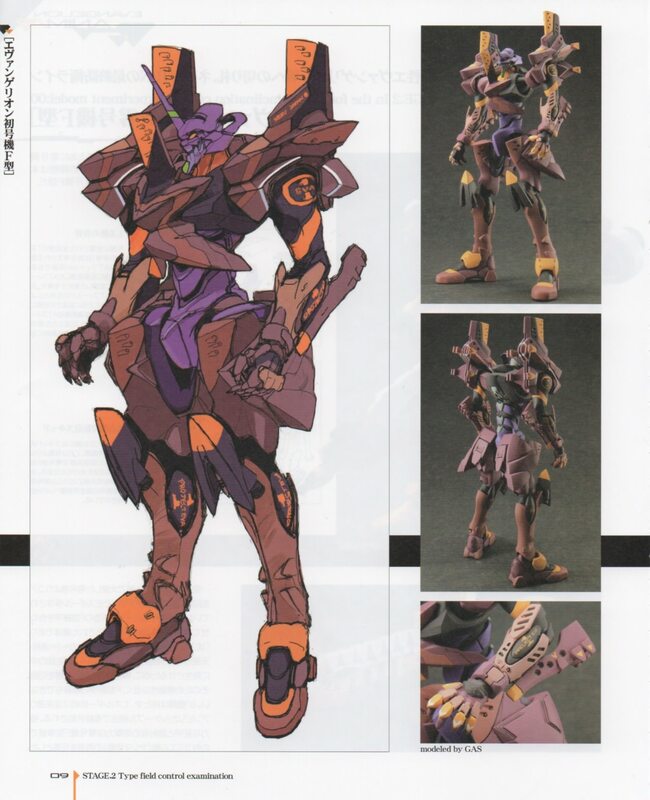 They had the funds to completely redo the armor of Unit 01 every time its power somehow increased, but they couldnt afford to give Unit 00 a practical leg? Oh, that. Apparently the peg-leg is an intentional design choice as part of Unit 00's new sniper set-up. It's supposed to act as a shock absorber and a brace when it's firing. 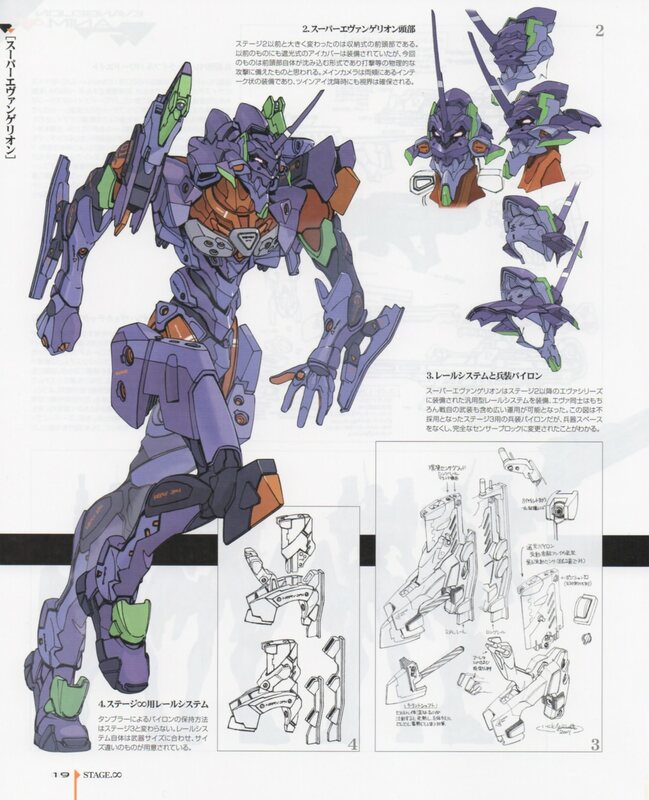 I don't know why it couldn't crouch or brace against something with a normal leg like Unit 08 does, but keep in mind that this is the guy who made Unit 02 space-capable by turning it into a centaur with the UX-1 Allegorica attachment.